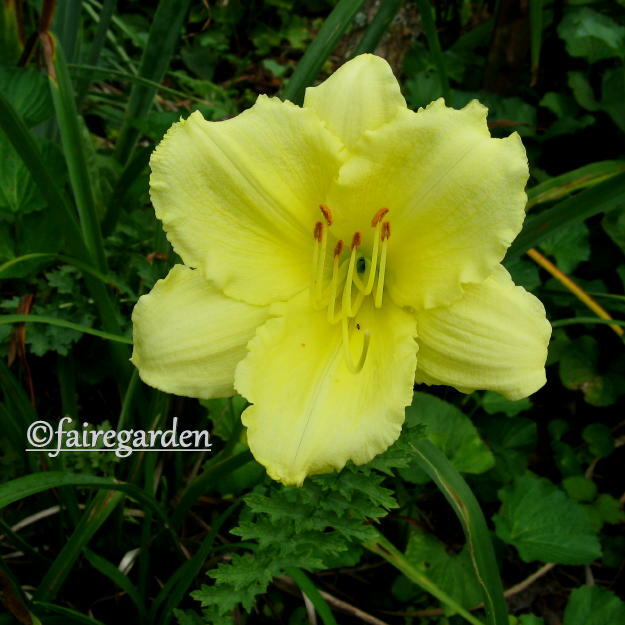 Welcome one and all to the Fairegarden blooms for bloom day in August 2012. The weather has been weird from January onward, but the strongest and maybe more importantly, the most adaptable plants are taking it in stride. 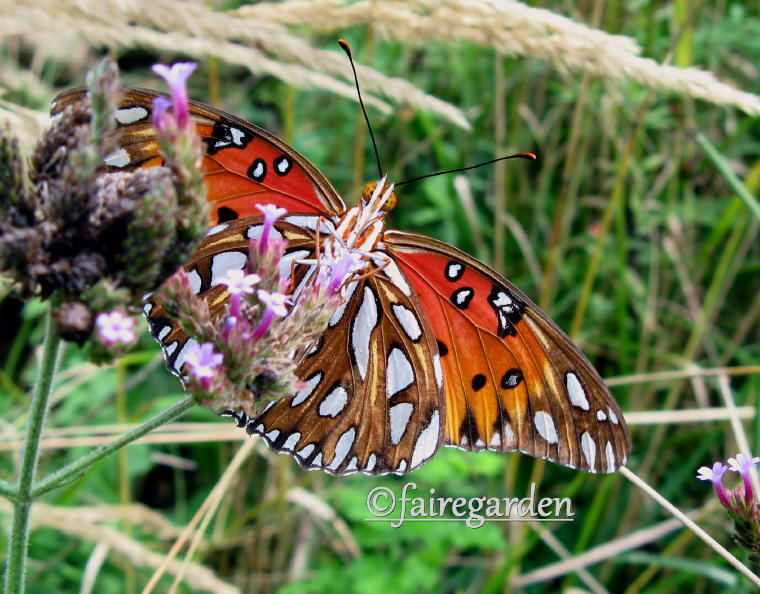 In the lawn/meadow, a Gulf fritillary butterfly sips on Verbena bonariensis with the lavender spikes of the Liriope edging showing behind. In the Ferngully area, the former home to a gigantic red maple tree that died and was taken down shortly after we moved to this property, Joe Pye weed, Eupatoriaum purpurea ‘Gateway’ greets the morning sun. 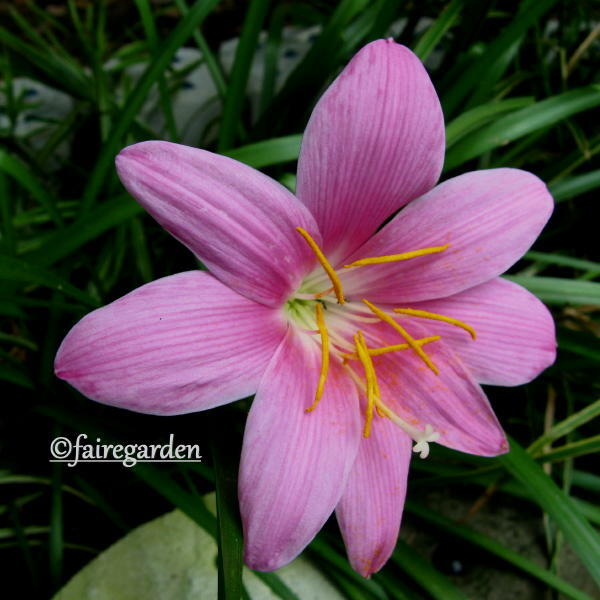 Every now and then, after we are blessed with precipatation from above and the stars and planets are in perfect alignment, the rain lily, Zephyranthes grandiflora will shoot up a pink flower. These were sent in error by a bulb company several years ago and finally bloomed for the first time last year. A lone daylily, Hemerocallis ‘Happy Returns’ is reblooming in the yellow/white garden. Several of the daylilies were fed and groomed with hopes of reblooming. So far, this is the only one to do so, but hope remains for more. Hey, it could happen! This sweet little Cuphea with no tag has been blooming all summer. A dozen of them would make quite a show, but this lone one is doing quite all right. 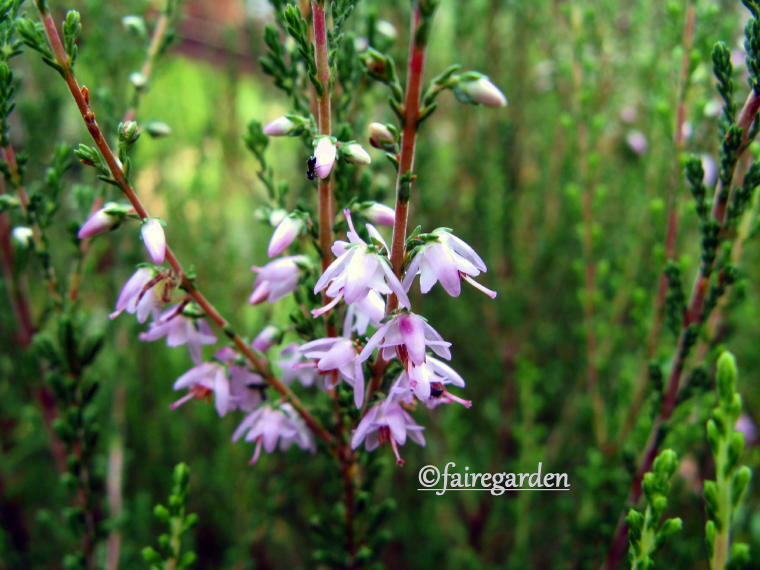 Calluna vulgaris ‘Red Fred’ is blooming a light lavender. The red moniker comes from the new foliage color, supposedly, but it is not that red here in Southeast Tennessee. Nice, though. 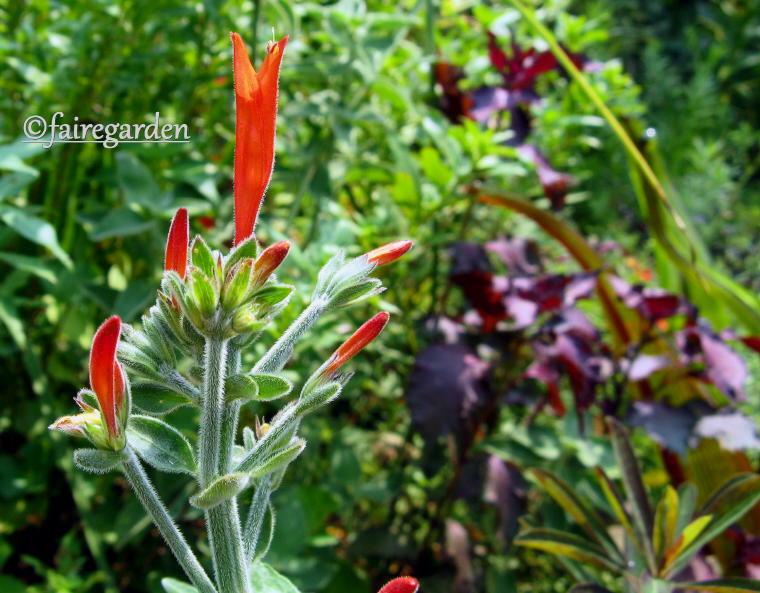 Dicliptera suberecta, blooming now in its second year here offers up reddish/orange tubes of goodness to visiting hummingbirds. This one might have cuttings taken now that is has proven hardy here. I like the silvery foliage, too. 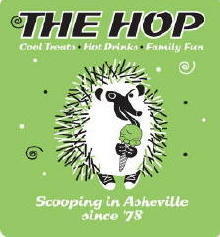 Purchased during the Asheville Fling 2012 at B.B. Barns Nursery, Dahlia ‘Mystic Spirit’ has performed well above average in both foliage and flower. 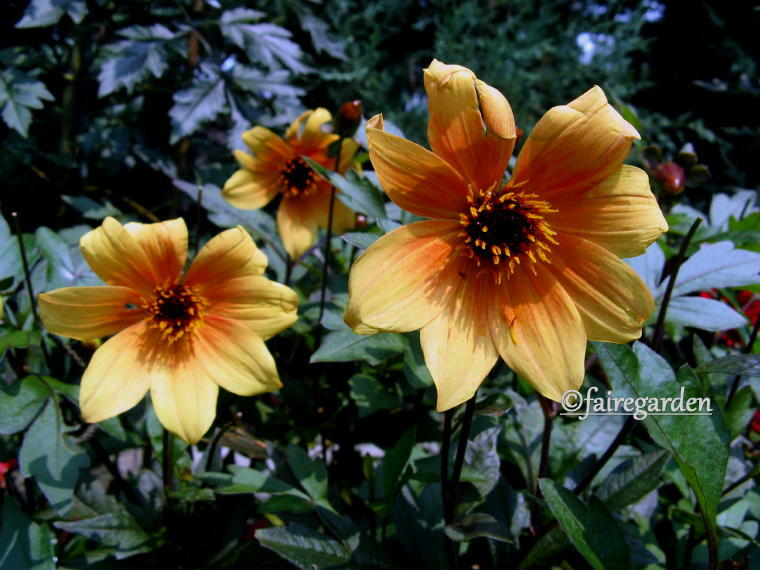 I hope it winters over like the Gallery Series of Dahlias have, so far. Blackberry lilies, not lilies at all but related to the iris family, Belamcanda chinensis have seeded themselves far and wide in the sunny, hot and dry Shed Bed. This bed never gets any irrigation other than rainfall and is planted with species that need it not. Eryngium ssp., Salvia greggii and Stipa tenuissima, among others have proven immune to drought and heat. 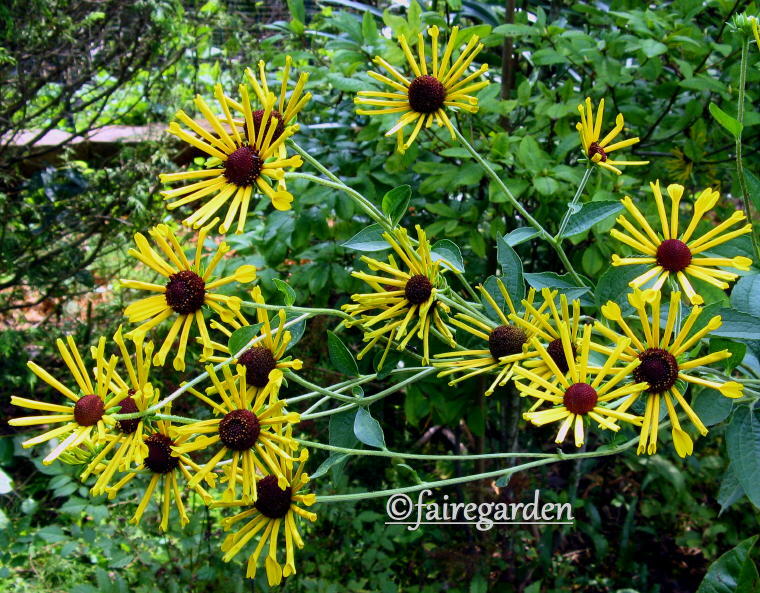 Growing a little shorter this year, Rudbeckia lanciniata is beloved by butterflies, bees and goldfinches. The gardener likes it, as well, for the height and later blooming time, along with the evergreen rosette of dark green leaves. Aristolochia fimbriata is a little puff of the Dutchman’s pipe vine family. The bloom this year is the best ever, for who knows why. Cute, isn’t he? 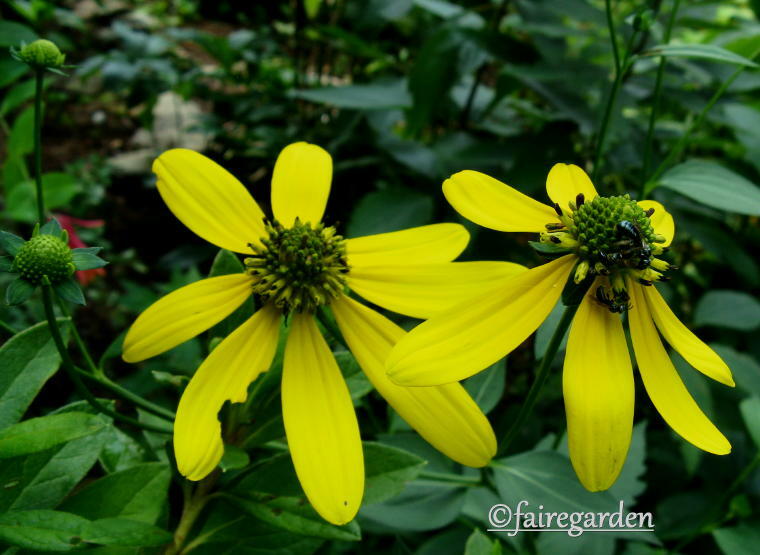 Rudbeckia submentosa ‘Henry Eilers’ has fluted petals and is five to six feet tall. It needs staking here, but is worth that extra bit of gardening effort. Clematis ‘Rooguchi’ has decided to rebloom. We are thrilled about that. 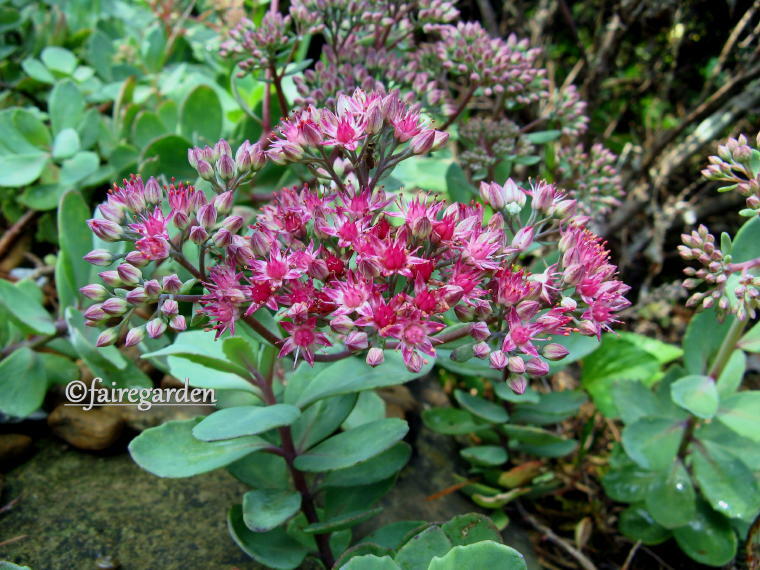 Sedum ‘Vera Jameson’ is a sprawling groundcover type that edges the heather bed. She grows very nicely under the Callunas and sticks her head out towards the pathways in late summer with darker pink flowers. We end with the same butterfly as shown in the opening shot, the Gulf fritillary, this time showing the beautiful coloration of the underside of the wings. 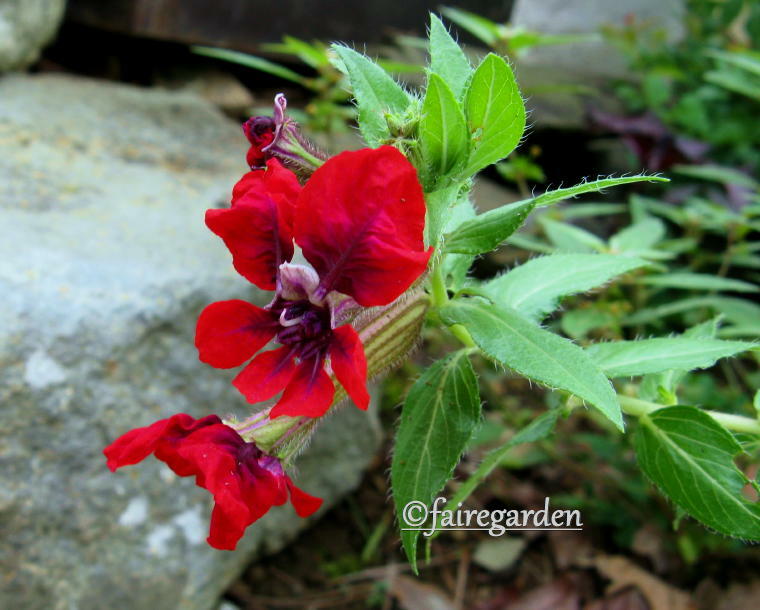 For more blooms from around the world, check out my good friend Carol of May Dreams Gardens’ Mister Linky widget for more Garden Bloggers Bloom Day posts. 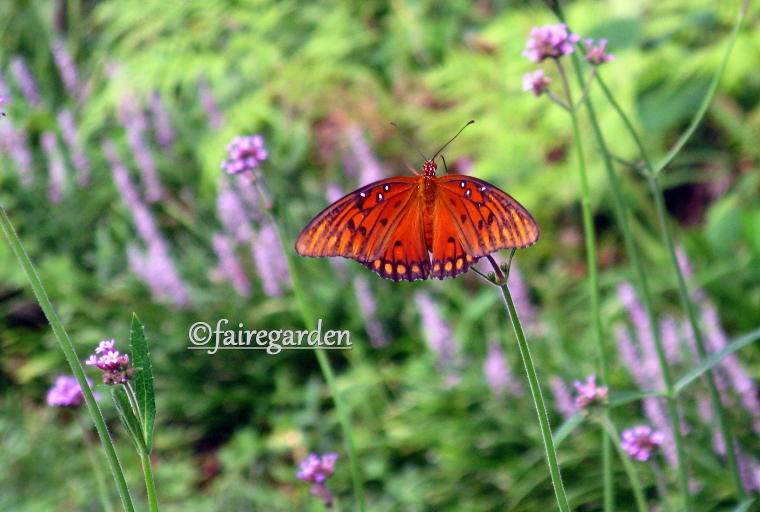 This entry was posted in Garden Bloggers Bloom Days, wildlife. Bookmark the permalink. You do have a lot blooming in your garden Frances. I really like that rudi and the Dicliptera is a new one to me. I like the foliage as well as the bloom. Happy GBBD. Thanks Lisa. There are lots of flowers scattered around right now, they just are not all together for a big show long shot. The Dicliptera is very nice. I just spread some rooted stems of it for a bigger patch of it. Happy GBBD to you! I have been seeing the Joe Pye Weed and wondering what it was! Many thanks for the identification! Thanks Cyndi. 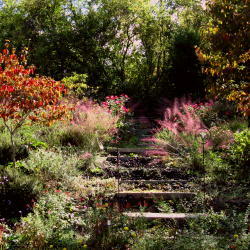 The Joe Pye is a mighty fine, and large plant that blooms late summer into fall, a native. Mine is a cultivar with darker stems and flowers and is a little bit shorter than the species, still 6 ft tall! 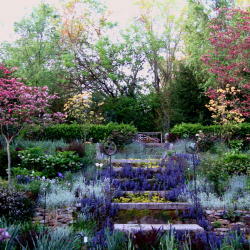 Bloom Day is a great way to read lots of blog posts about what is blooming all over the world. I love those rain lilies. I keep a container of them going, bringing it inside during the winter (to go dormant). It flowers a few days after almost every rainfall. This is the 5th summer that I have done that in my Minnesota garden. The bulbs were purchased off of eBay. Wow, Julie, that is a great way to keep those rain lilies and not miss the blooms. 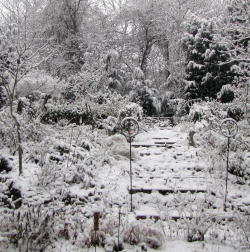 They are not really hardy here, but are planted outside in a protected area under the deck. Great blooms one and all. 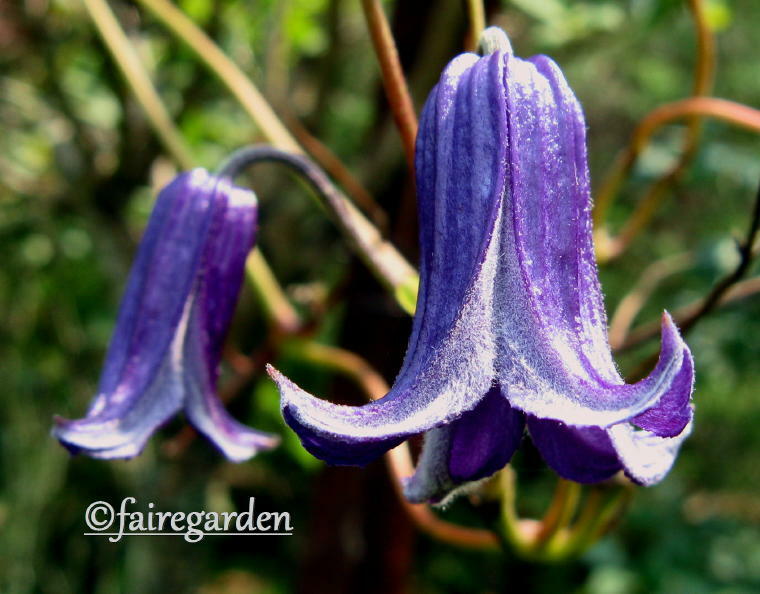 As I lost myself in the all beautiful pictures of blooms, I felt like the Meg Ryan character in Harry Met Sally, going “Yes, yes, yes!” Yum, the blue of the clematis ‘Rooguchi’ is delicious. And your blackberry lily has such wonderful tones of pink…it must be a different variety than my mostly orange one. They are generous reseeders but have a way about them that makes them pretty much always welcome. Hi Michaele, thanks for those pretty words! I have been selecting the blackberry lilies for the darker reds over the years, but they are still quite variable. All came from seeds gathered from one plant of a friend many years ago. 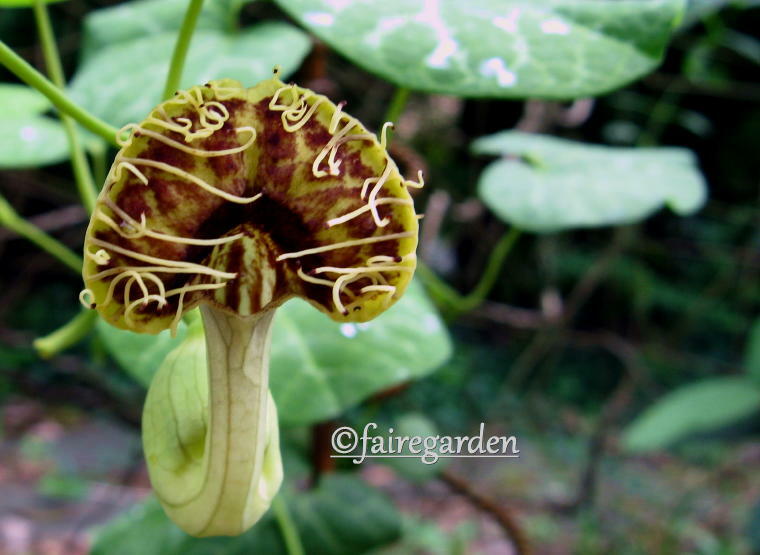 Great blooms all but special mention to the Aristolochia…want one!! Thanks Mark and Gaz. I believe the only way to find this dwarf Aris is to grow it from seed. Good luck! Hi Gail, thanks. I have four Henry Eilers and they are planted very close together, for a change! Need more. They came from Mouse Creek. The little Dutchman’s pipe is a cutie, barely a foot tall and the flowers only an inch or so. Happy GBBD to you! I love the photo of the Joe Pye in the sunlight–beautiful! Mine is not nearly as showy, and I’m wondering if maybe it needs more moisture. Lots of lovely blooms in your garden, not to mention the beautiful flutterby! Thanks Rose. My Joe Pye is a cultivar, Gateway, not the straight species. It has darker stems and flowers and is shorter than the wild one. Still very tall, though. My daughter has the ‘rougouchi ‘ clematis on her arbor and it blooms continuously all Summer. Love your August garden, Frances. Will the Dutchman’s Pipe tendril up a tree? Just trying to figure out where I could plant one. I have no fencing and the few pillars or trellises are spoken for. Hmmm, will have to ponder it. I am surprised your Blackberry Lilies are still blooming, mine have long since gone to seed pods. These beauties are reliable reseeders….love their little iris-like foliage plants scattered about the garden. This is the tiniest little vine, Janet, the Dutchman’s pipe, not even a foot tall! It is winding around a small metal corkscrew shaped thingey. The flower is barely an inch in diameter. You need a magnifying glass to see it, or a macro lens to photograph it. The blackberry lilies have been blooming for some time, but there are a few late to the party ones still budding out. I love them and they laugh at the heat and dry. Hi Larry, thanks for returning and welcome back! Once upon a time, I had ‘Happy Returns’. It did rebloom reliably until I killed it by leaving it in a container over the winter. It’s a much prettier plant than Stella. Great shots of the fritillary. Thanks, MMD. That is too bad about your dead daylily. It is way nicer than Stella, if not quite as floriferous. Quality over quantity. Your August blooms are enchanting Frances… just as a Fairy Garden should be. One can almost hear the whispers of the little creatures who reside there. Hi Carolyn, thanks. There is magic in the garden, or is it just the birds, turtles, etc? Of course, those ARE magical, aren’t they? The flower on your Aristolochia almost looks as it could be sinister. Happy GBBD! Happy GBBD, Les. Yes, it looks more biological than botanical. I might put that shot aside for the Hallowe’en post! Gorgeous blooms! Love love LOVE that picture of the Aristolochia. I have that one, too, but it’s not been in bloom much. Too hot & dry right now, I guess. Thanks Cindy. The little Dutchman’s pipe was thought dead for a couple of years, then it showed up again for a couple then this year it bloomed again! More water is the key, and a little topdressing of compost. Frances that Aristolochia fimbriata is amazing along with so many unusual plants blooming. Wow, the Cuphea is stunning. I’m not very familiar with it. And you have some interesting varieties of plants. Happy belated GBBD! Thanks Plant Postings. The cupheas are not often seen, but when one is spied at a nursery, I grab it. I would have grabbed a bunch of this one. Happy GDDB to you! 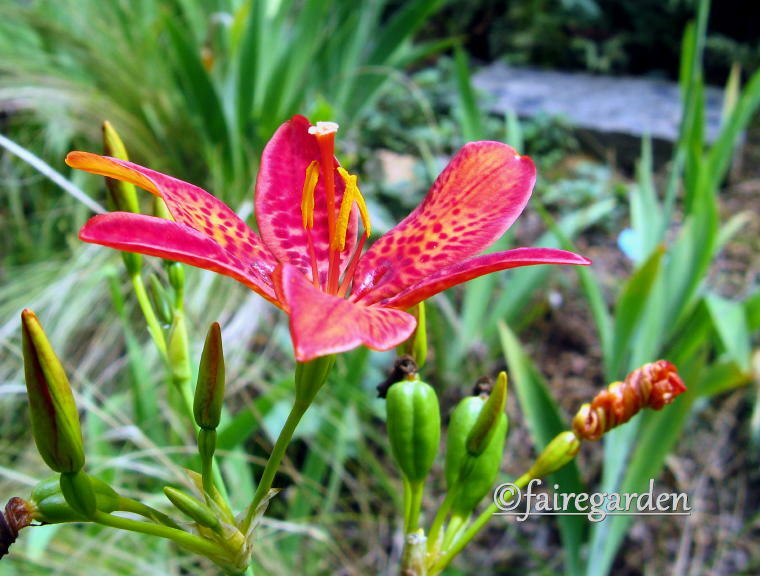 I thought blackberry lilies had an orange flower, but yours looks hot pink! Am I wrong about them, or does my vision need correcting? If your are really pink I would like some seeds. I have been told that the blackberry lilies are extremely variable, having crossed with the candy lily, Pardancanda at some point. I have been selecting the redder ones, but they are actually a mix of many, many colors, some with freckles, some without. I had a couple of solid yellow ones show up that I moved to another location, but those have not produced seeds, so far. I will be happy to send you seeds. Beautiful post, as always! Love, love, love ‘Rooguchi’ such a stunningly beautiful plant. 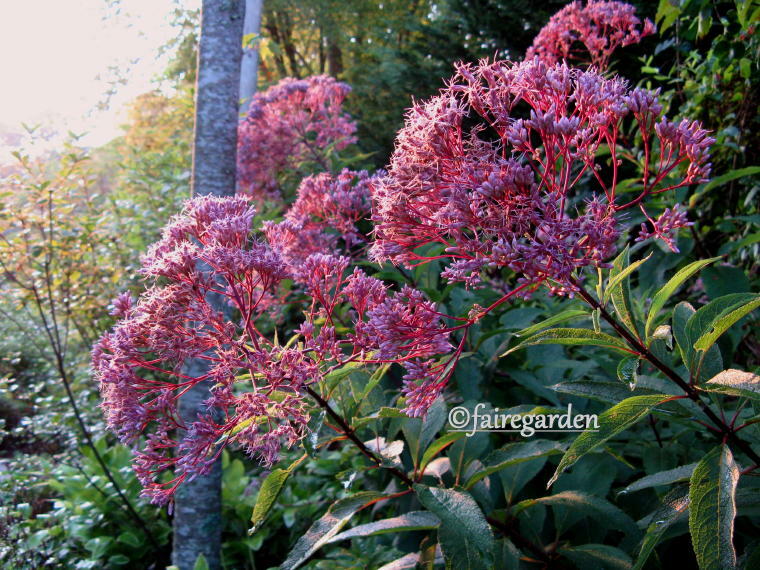 I just planted some ‘Vera Jameson’ and have been really please with it…very pretty! Hi Scott, thanks so much. Funny thing about the little clemmie, it has been very disappointing for several years, hardly blooming at all. With a little compost added and weeding and some extra water, it has become a star. You will love Vera Jameson, she is a sprawler but is very dependable.